Bar Harbor is a town on Mount Desert Island in Hancock County, Maine, United States. On the 14th (Tue), visit a coastal fixture at Egg Rock Light, take in the spiritual surroundings of St. Saviour's Church :, examine the collection at The Seal Cove Auto Museum, then take an in-depth tour of Abbe Museum, and finally view the masterpieces at Little Village Gifts. To find ratings, reviews, where to stay, and more tourist information, go to the Bar Harbor trip planning website . Santo Domingo, Dominican Republic to Bar Harbor is an approximately 20-hour flight. You'll gain 1 hour traveling from Santo Domingo to Bar Harbor due to the time zone difference. Expect a daytime high around 18°C in May, and nighttime lows around 7°C. Finish your sightseeing early on the 14th (Tue) to allow enough time to drive to Rockland. Rockland is a city in Knox County, Maine, in the United States. Start off your visit on the 15th (Wed): visit a coastal fixture at Maine Lighthouse Museum, then see the interesting displays at Owls Head Transportation Museum, and then look for gifts at Maine State Prison Store. For more things to do, traveler tips, photos, and tourist information, use the Rockland sightseeing planner. Traveling by car from Bar Harbor to Rockland takes 2.5 hours. Alternatively, you can take a bus. In May, daytime highs in Rockland are 17°C, while nighttime lows are 7°C. Wrap up your sightseeing on the 15th (Wed) to allow time to drive to Ogunquit. For maps, reviews, more things to do, and more tourist information, use the Ogunquit route maker app . Drive from Rockland to Ogunquit in 2.5 hours. Alternatively, you can do a combination of bus and train. 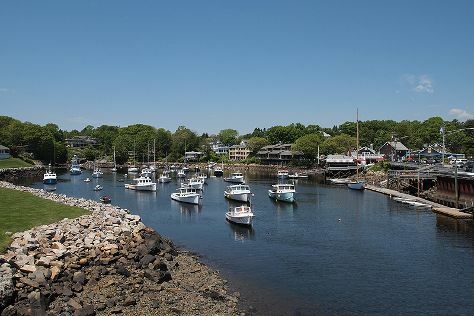 Traveling from Rockland in May, you will find days in Ogunquit are a bit warmer (22°C), and nights are about the same (7°C). Wrap up your sightseeing by early afternoon on the 16th (Thu) to allow time for travel back home.